Meeting of two fine minds. Featuring Janet Ulrich Brooks (Zelda) and Elizabeth Ledo (Rachel). The set for The How and the Why thrusts into the middle of Timeline's space suggesting that the play will thrust at us as well. It does. Life will not be yanked from the quotidian and unfold in an artificial time Zone. Instead, as music of inner sphere of the gene tinkles and chimes around us, we pick up on the lives of two evolutionary biologists in real time. The pre-eminent scientist Zelda contemplates and scribbles at her worktable. Janet Ulrich Brooks in a Hillary-pants suit commands. A young woman Rachel enters the office. Zelda has neglected to include her in an important conference. 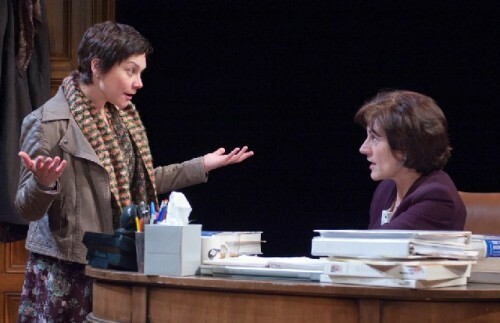 Rachel, in a bustling, semi-hysterical performance by Elizabeth Ledo, wants in. Their deeper connection is revealed to audience members at different times. It is not flagged. The play is not formed by an arc created by the playwright. Instead, the arc is created by each audience member. This two hander is a she says-she says drama to the extent that she says and then she says. The language they are using, particularly the young woman’s, is not her realistic voice, but rather the playwright’s. Language evokes mood and temperament. You may or may not understand at the moment why champagne is an appropriate drink at 10am. By the play’s end, in real time, all is clear. We have been invited into an ongoing life. The questions that irritate also keep us glued to the proceedings. Zelda developed in a world where Gloria Steinem’s notions held sway. Many women who wanted children and a husband as well as a big career listened to Steinem. She had neither a husband nor children. Unfortunate choices were made. Zelda was one of Steinem’s victims. She made what most women today would consider false choices. Rachel is faced with the same conundrum. Women, once they could own property and vote, seldom decide their path quickly. We want to have it all. “Life is either boring or hard,” Zelda quips. Today, like Rachel, a young woman has a partner as her partner (husband). She can incorporate him in the game plan. Rachel has come up with a new theory of menstruation. She posits that the endometrium sloughs off the bad germs that come in with sperm. She is sharing credit for the theory with her partner, Dean. Zelda presses: Whose idea was it? Who wrote the abstract for the article? Who wrote the article? Rachel is steadfast: This idea grew out of days and weeks of conversations between Dean and me. It is as much his as it is mine. Rachel makes it perfectly clear that she wants it all: her career as an evolutionary biologist, her man and children. Zelda insists, until she cracks near the end of the play, that career is all. This is clearly Rachel’s moment and Dean be damned. In Timeline’s staging, intimacy is pressed up against our noses. 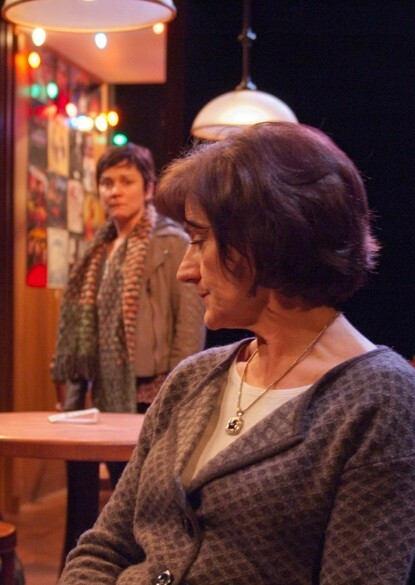 The thrust stage, created by Collette Pollard, sticks it to us and brings up close the anguish of the women’s faces, their fun, their feistiness. Costume contrasts by Alison Siple fit both the age and the spirit of the characters. More deeply than Proof, we are drawn into the intellectual arguments being lofted. Engagement is on every level from the most primitive emotional to the turns and twists of fine minds. As James Watson is fond of saying, everything is in the question. There are no answers in The How and The Why. But you are left with many intoxicating questions to carry away. This represents Timeline at its best.